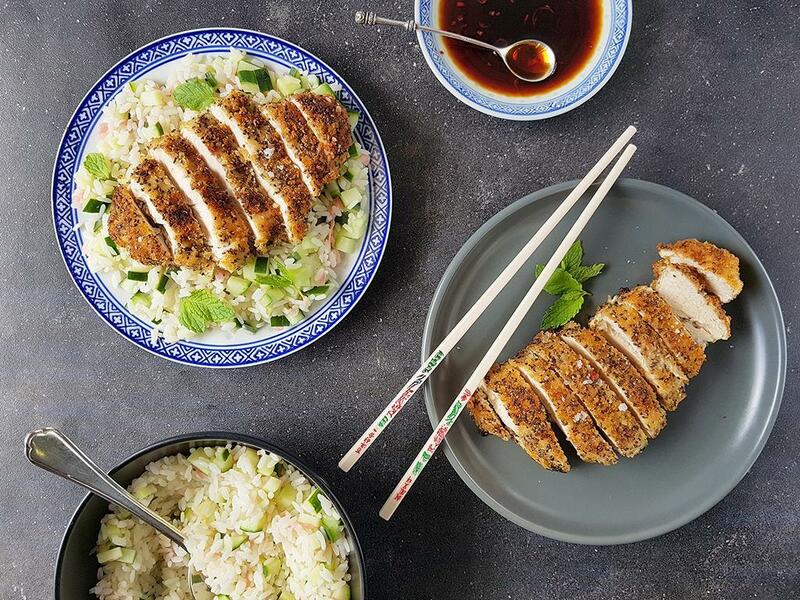 Crispy chia seed coated chicken breasts served with fragrant & spicy ginger & cucumber rice. Brown rice (parboiled): Pour boiling water (¾ cups for 1) into a pot on high heat and add the rice with a pinch of salt. Bring to the boil, cover, turn heat down to low and gently simmer for 18-20 minutes. Drain and leave to cool down slightly. Crumbed chicken breasts: Place the chicken breasts between two sheets of cling wrap and bash with a rolling pin (or full wine bottle) to flatten (1½ cm). Season with salt and pepper. Dip the chicken breasts in the beaten eggs (shake off excess), then in the Chia Mix. Place a pan on medium-high heat and cover the base with olive oil. When hot, add the crumbed chicken and fry for 3-4 minutes a side until golden and cooked through. Season with salt and pepper. Remove and drain on paper towels. Serve crumbed chicken and rice topped with torn mint leaves and the soy as a dipping sauce – you can mix in the chilli if you like a little spice.